The shock-expansion theory of the previous section provides a simple and general method for computing the lift and drag on a supersonic airfoil, and is applicable as long as the flow is not compressed to subsonic speeds, and the shock waves remain attached to the airfoil. However, the results of this theory cannot generally be expressed in concise analytic form. In fact, the theory is mostly used to obtain numerical solutions. However, if the airfoil is thin, and the angle of attach small, then the shocks and expansion fans attached to the airfoil become weak. 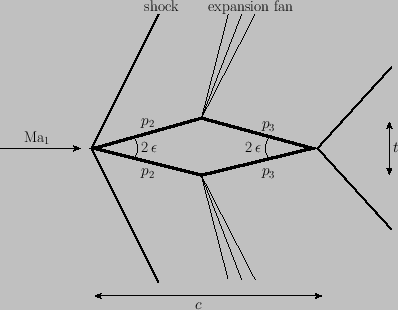 In this situation, shock-expansion theory can be considerably simplified by using approximate expressions for weak shocks and expansion fans. which is correct to first order in . Here, is the deflection angle relative to the upstream flow. This is the fundamental formula of thin-airfoil theory. It states that the pressure coefficient is proportional to the local deflection of the flow from the upstream direction. The focus (see Section 9.3) of the airfoil is at the midchord. Moreover, the ratio is independent of . Figure: A diamond-section airfoil. is the upstream Mach number. and denote pressures. 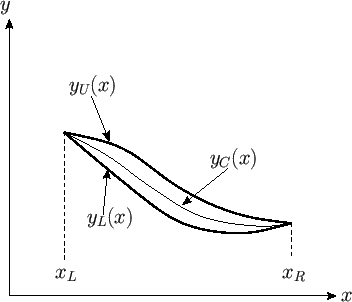 Figure 15.12: An arbitrary airfoil. Hence, the airfoil shape is completely specified by the thickness function, , the camber function, , and the mean angle of attack, . respectively. Thus, in thin-airfoil theory, the lift only depends on the mean angle of attack, whereas the drag splits into three components. Namely, a drag due to thickness, a drag due to lift, and a drag due to camber.